My first reaction when learning about the TipNovus pipette tip washing instrument was "How can this be?" Anyone familiar with using racks of sterile pipette tips in the laboratory most likely shares my preconception. After speaking with Ali Safavi, inventor of the TipNovus and CEO of Grenova, I became quite eager to share our interview below. The words "game changer" get thrown around a lot, but in this case it's a bulls eye. What is the most important thing you would want scientists to know about the TipNovus machine? This is a proven technology. They are not the first ones to adopt this technology. This quite different than when we started three or four years ago. The number of tips being reused in accredited labs speaks for itself. Our customers are scientists who are open to a new, better way of doing things. Yes, it introduces a big financial savings. It's also more environmentally conscious and sustainable. 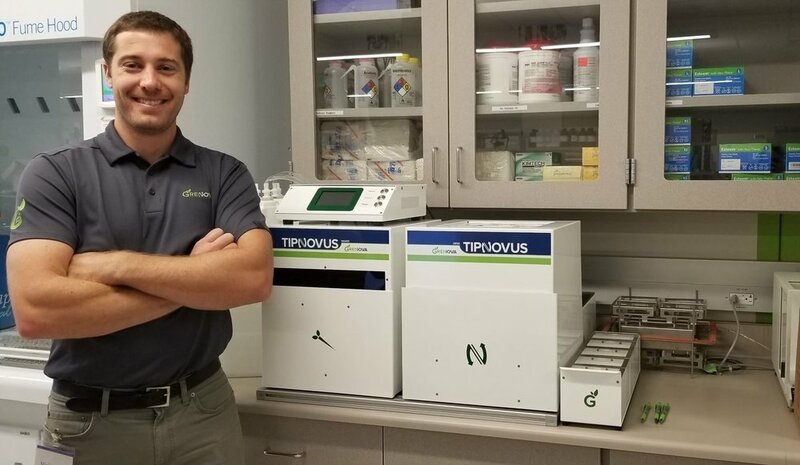 What kinds of labs are using TipNovus machines now? We have a wide variety of customers. One of the largest U.S. hospital systems and an international pharmaceutical company both useTipNovus. There are clinical labs, toxicology labs, genomics labs, next generation sequencing labs, pharmacology labs, research labs and government labs. These are labs who are open minded to re-use instead of discarding everything as a disposable. Environmentally conscious biologists, who contact Labconscious, often buy pipette tips in bulk, then load tip racks, autoclave tip boxes to sterilize, use then discard the tips and finally recycle the tip boxes. How does this machine improve on that for them? The process you mentioned is time consuming, labor intensive , more expensive and still leads to a lot of unnecessary plastic waste. Our system is more reliable because it does not use heat, using an autoclave can warp pipette tips. Our customers have validated reusing tips up to 40 times. There was no failure even at that point, they just choose to stop. The average minimum savings is 90% of the lab's consumables budget by reusing tips 10 times. This pipette tip washer is a one step solution. You walk away and come back to clean tips. Instead of discarding the tips after use, scientists just eject each tip back into an empty rack. The racks go into TipNovus. Depending which system, Tipnovus can process 4 racks every 10 -12 minutes. The smaller system can process one rack every 6 minutes. The system has a dryer that can be used in parallel. It's easy to get 20 tip racks ready to be re-used every hour. The old way that you explained takes much longer. By the way, the 90% cost savings doesn't include the labor time saved. The cost of shipping and receiving the tips also isn't included. Scientists are paying for that on invoices, although it doesn't appear in purchase orders. What is the environmental goal pipette tip washing? We are trying to create a perfect circle which allows labs to reuse and recycle pipette tips. When the lab is done using the tips, they can just use the machine one last time. Rather than discarding into biohazard waste, which is an environmentally and economically costly process. These clean tips can be recycled, or ideally sent back to tip manufacturers for reuse. This means less energy and water used, no plastic waste and less emissions from shipping all this plastic around! Do labs need to be running robotic assay systems to benefit from this device, or can a typical lab benefit? It doesn't matter if the lab is using automation. Every pipette tip counts. Just like we say in our every day lives that every plastic bottle counts. Every 15 tips has the same amount of plastic as in a bottle. The cost benefits increase with the number of tips the lab is going through. Regardless of the size of the lab, there is always a savings. Let's say that it's a university environment with a lot of post-docs and grad students coming and going. Do you have any guidance on an easy start? Yes we provide very straightforward validation templates that work for any type of lab. The main thing is you take the tips for whatever work you do on a daily basis, wash those tips and re-use. Can the results using washed tips match the results we get with new tips? The system itself is automated. The wash protocol is locked once its validated, there is just one button to push. There is no room for user error. The system monitors each step of the wash to ensure it is executed exactly the same way every time. Do customers need to be a BSL-1 lab? Absolutely not and oru current customer base is not limited to BSL-1 labs. There are no limits on the system. We designed it to be high throughput. It's designed to be safe for the users. It was designed to be fully chemical compatible - to be used to with any sort of chemical. Whatever wash treatment required will work. For example bleach and alcohol assisted cleaning can used. Our customizable wash means labs with any BSL designation can take advantage of pipette tip reuse. What about the liquid waste? TipNovus does not produce any hazardous liquid waste. Our GrenoClean cleaning solution buffers waste chemicals and neutralizes the waste. Liquid waste coming out has been treated by UV so it's clean. The waste water goes down the sink. Our customers' labs have tested and validated that there is nothing harmful in the liquid waste. Not a trace. The system has the function to collect a portion of the liquid waste in the container, if labs are using, for example, radioactive waste. This container could be treated. Here are a few simple set up questions. What kind of space do these machines require? Do they throw heat? Can it clean any pipette tip type? Those are great questions. Our systems were specifically designed with flexibility in mind. Grenova systems can be configured to work with any manufacturer tips from 10ul to 5ml sizes. Any rack configuration is possible. The system produces no heat. It uses a standard electrical outlet and an air source. We designed the machines to be pneumatic - to work with compressed air. All the movement in the machine is a spring load type system, using compressed air rather than electric motors. This produces three big benefits. First, there is no issues with breakdown and services needed. Second, because the system is pneumatic there are no charges to liquids so there is no chance of explosion. Alcohols will not catch on fire. Third, it's highly energy efficient! Our high-throughput system takes 2 x 2 feet. It's a bench top system. The mini is only 1.5 x 1.5 feet. TipLumis is a post washing option to keep the tips in a sterile environment. We know space is a premium in labs so we started offering custom carts that accommodate our systems. These carts are mobile. The systems can also be made to stack these machines vertically instead of taking up horizontal space. It's very flexible. The biggest challenge right now is the culture. It's an interesting predicament. We present a technology that is sustainable, with huge cost savings, to scientists who are knowledgeable environmentalists. The job of scientists is to look for new solutions. Yet sometimes we only focus on the science, and not how it happens. Everyone is working on more precise assays and making discoveries. The cost of filling up a landfill with plastic and the high expense of purchasing plastic gets lost. Reusing pipette tips sounds new, yet at the same time it was pointed out to me once that this process is actually something that labs did in the past. TipNovus is just a better automated way of doing it. Yet when presented with this technology it is so innovative, that people can freeze up. HA! Well, scientists hold reliability paramount. It sounds like Grenova has gained a lot of lab users? That's right. When you talk about reliability, any new technology, or even a repeat of existing technology, that goes into the lab gets validated first. Introducing a tip washer is no different. The results must be the same as with brand new tips. Scientists from the CDC, the NIH, the University of Washington, and the University of Oklahoma have presented posters at conferences of their use of TipNovus. As I mentioned, we also have customers that run a large hospital lab system and international pharmaceutical laboratories. It's a solution that everyone wants to keep secret. Savings hundreds of thousands, or millions of dollars, gives them a competitive advantage in terms of profitability. Therefore, they don't want competition to know. One of the things I'm most proud of is that this system is both greener and creating jobs. When laboratories wash 20 tip racks every hour, they save the cost of $5-12 per rack. That saves $140 an hour. Labs get positive cash flow and the unit pays for itself. The savings are substantial enough that they can hire a new staff to run the tip washers. That's a newly created job that can support someone's family, while making the overall industry more green!